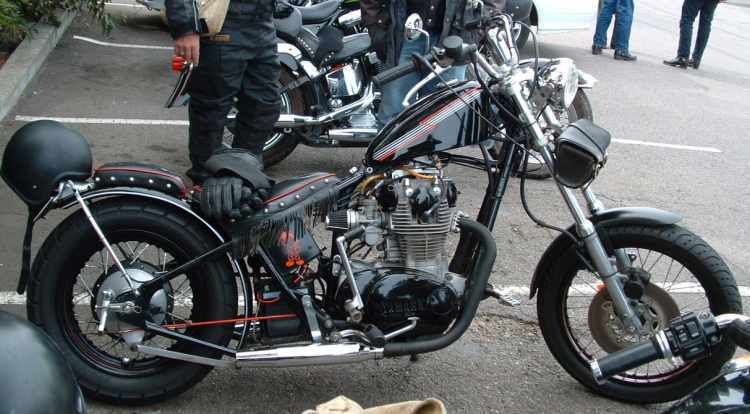 Nice XS650 photographed by Tazipom on Anzac Day run... Fringed seat makes a nice difference. Hope to organise a few more photos of this bike soon. Yeehaaaa! Nothing cooler than half adozen stretched out laid, back chopper jocks boogeying!!! nice bike another SA bike a. i'm out on the road during the week but mostly in winter but have seen some jap chop's mostly down south thoe. not much up north just as yet. we need to get out there and get a high profile to show these people that u dont just chop harly's. once i'm on the road ill do all i can to help andrew spread the word. Tazipom tookd the pics at the Longh Riders Anzac Day run. Says there were about 200 bikes.